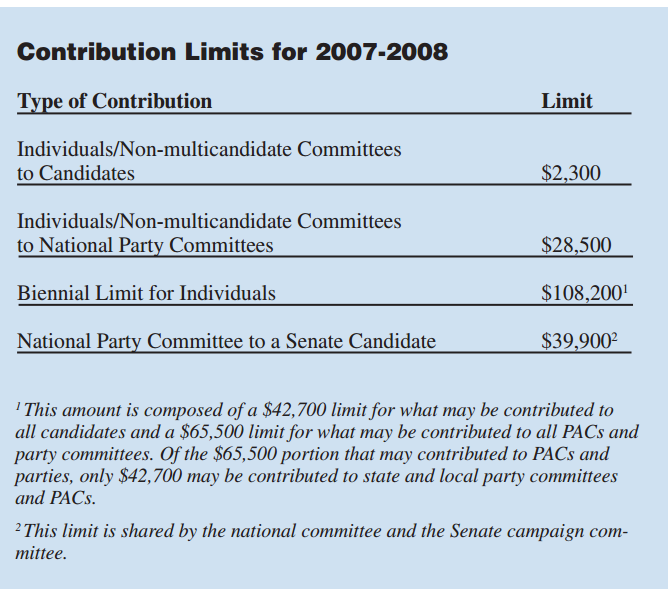 The limit on contributions made by certain political party committees (2 U.S.C. § 441a(h)). Please see the chart for the contribution amount limits applicable for 2007-2008. The inflation adjustments to these limits are made only in odd-numbered years, and—except for the biennial limit—the limits are in effect for the two-year election cycle beginning on the day after the general election and ending on the date of the next general election. The biennial limit covers the two-calendar-year period beginning on January 1 of the odd-numbered year and ending on December 31 of the even-numbered year. Please note, however, that these limits do not apply to contributions raised to retire debts from past elections. Contributions may not exceed the contribution limits in effect on the date of the election for which those debts were incurred. 11 CFR 110.1(b)(3)(iii). The BCRA also introduced a rounding provision for all of the amounts that are increased by the indexing for inflation. [fn2] Under this provision, if the inflation-adjusted amount is not a multiple of $100, then the amount is rounded to the nearest $100. 2 This provision also affects the indexing of coordinated party expenditure limits and presidential expenditure limits. 2 U.S.C. §§ 441a(b) and 441a(d).